The vineyards of Cantina Frentana are located west of the village of Rocca San Giovanni, which lies about 50 kilometers south-east of Chieti, east of the central Apennine mountains near the historic city of Luciano, in the very heart of the Abruzzo region, part of the Chieti province, and a stone’s throw from the Adriatic sea. The Frentana winery praises itself for having one of the most efficiently operated wine growing co-operatives in Abruzzo. Frentana began in the late fifties with a few small selected vineyards and wine growers, and in the last forty years has grown to more than 400 members. These growers are assisted throughout the entire grape growing season, right up to harvest, by the highly qualified Frentana staff (which includes an agronomist and enologist) in an approach aimed at very specific grape yields considered worthy of wines with the traditional Frentana standard of quality. All the latest, most up-to-date wine making equipment and techniques are used together with a wealth of collective historical wine making knowledge, to produce great Frentana wines. Nowadays, the 500 vine growers attend about 750 hectares of vineyards in the area Frentana, a name that is derived by the ancient people, Frentani, who populated that region. The cantina was founded in 1958 by the doctor, Francesco D’Agostino, who was trying to protect the local producers from the uncertainties linked to the free market of the grapes. At first, the idea was to vinify the grapes and sell the wine to bottling companies. Over time, this society became a winery itself and took over the entire process of winemaking. This evolution required ample changes to the productive and organizational model of operation. The company added a lot more attention and care to the quality of each different phase of the process, from the vineyards implants to the bottling, and the sales services. Cantina Frentana rediscovered almost unexpectedly the Cococciola grape variety. This white grape is indigenous to the territory of Rocca San Giovanni, and is principally grown in Abruzzo. It now can also be found in very small quantities in other Italian regions, Puglia among others. According to recent genetic studies, it seems to be related to the excellent and much better known Pugliese grape called “Bombino bianco”, well known enough in fact, to be characterized as “a varietal of noble lineage”. 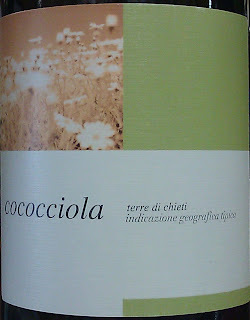 Once considered as a good blending grape because of its ability to equalize the “must” imbalance, Cococciola had never been studied as a serious grape of merit. Cantina Frentana has made a beautiful and pure 100% Cococciola wine proving that this is indeed a grape with noble genes, which can proudly stand on its own. Usually harvested in the second week of September, the grapes, grown under the traditional "tendone" overhead trellis system, are soft pressed and fermented in stainless steel tank at a controlled temperature. The wine remains on it lees with periodic “rimontaggio” (“remontage” in French or “pump over” in English), followed by 2 months in the bottle before release. In the glass, 2009 Cantina Frentana (Vallevò) Cococciola Terre di Chieti presents a clean, crisp pale straw color with greenish reflections. The nose is floral and mineral, zesty and herbal with extremely fresh and enticing white fruit and citrus aromas, mingled with subtle notes of green apple and unripe melon and light herbal essences. The palate is incredibly zesty, crisp, floral, and mineral, even a touch salty (surely due to the proximity of the Adriatic sea) and offers appealing flavors of lemon peel, zest and unripe white fruit enhanced by very good acidity. The finish is quite long, light and mineral. Overall, this wine is really nice, fresh with lively acidity yet soft textured, zesty and limey, and charmingly versatile. That slight touch of saltiness, or spiciness depending how your taste buds will interpret it, makes it a food-oriented wine. I love this little wine. Delightful as an aperitif or to enjoy with all types of seafood dishes, shellfish and light meats. Serve chilled. For sure, it's a delicious sort of grapes!